Let us know if you want to hear about future programs, tours, activities, and history discovered. Is there a history topic you'd like us to present or a local history site you'd like to visit with our group? 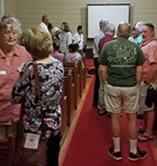 In addition to regular scheduled meetings, there are opportunities to join others in exploring historic resources in the area and in researching inhabitants and life in the Johns Creek area during earlier times. See what's happening. Join us at our next meeting of the Johns Creek Historical Society! Our Meetings are usually held on the first Wednesday of the month at 7:00pm. Location varies and so can dates, so please check meeting postings. 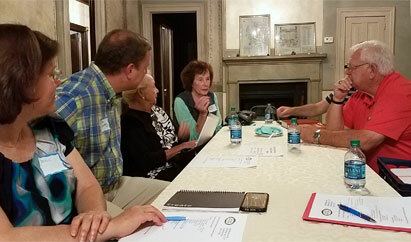 Meetings are a chance to hear about history related activities in the Johns Creek area, learn from programs and lectures, share discoveries in local history, hear memories of long-time residents, and network with others interested in capturing the past. 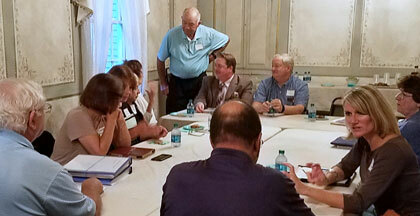 Johns Creek Historical Society meetings are free and open to the public. Our February meeting was a casual meeting without a speaker. It was a great chance to meet others interested in learning and preserving history, to ask questions about local history, to share your interests or knowledge of the past, and to see some of our ongoing history research and projects. 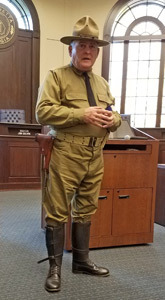 "Veterans Day Program in Honor of the 100th Anniversary of Armistice Day"
This was the first event of the North Fulton History Alliance, hosted in partnership with the Alpharetta, Roswell, and Johns Creek Historical Societies. The program included comments by Veteran Roger Wise and Presentation of the Colors by the Johns Creek Veterans Association Color Guard. Martine Broadwell told the story of WWI service by a local resident. Nurse Camille O'Brien - the only nurse from the famous Emory Unit to die in the unit's service in Algeria and France. 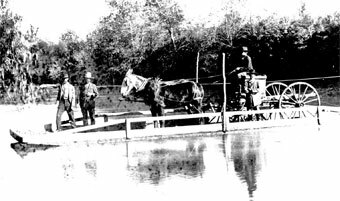 The Steele's Bridge incident - an army convoy on a secret mission to arrest WWI army deserters hiding in southern Cherokee County. In the rotunda, there was an exhibit of WWI artifacts and photos of WWI service members related to local residents and the Alpharetta History Room was open before and after the program. 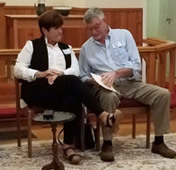 "Memories of McGinnis Ferry Road and Shakerag"
This program featured Jan Bell Webster and Charlie Boyd in conversation about the history of the McGinnis Ferry Road and Shakerag area. Both descendants of the area's early settlers, they talked about early local history and related fun stories of growing up country kids when roads were still dirt and gravel (including McGinnis Ferry Road). "Two Families, One Farmhouse, Six Generations"
This multi-media presentation used original photos and artifacts to portray life in Maryland in 1889. After the Civil War, some freedmen remained where they were, making the choice to live and work on the farm where they had been enslaved. This presentation tells how three generations of formerly enslaved workers raised their families on the same farm, and how a 127 year-old “family photograph” reconnected descendants to their past, uncovered shared history, and established new relationships. 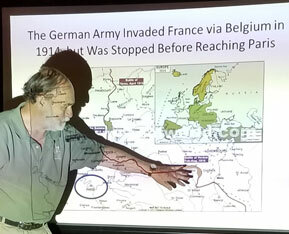 "Local Impact of World War I"
Gene Ramsay, area historian and co-author of "Images of America: Norcross" presented a program on WWI and the impact on the region. Clarke Otten presented a program about the historic ferries and bridges that crossed the Chattahoochee River in and near our area. 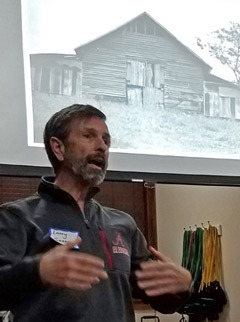 "A year in review and planning for the organization"
We looked at examples of oral histories from locals with long ties to the land that is today's Johns Creek. These memories of life when this area was a group of farming communities were captured on video, audio, and in written accounts that reside in both our archives and in other local resources. We caught up on history related activities and shared discoveries. Kirk brought "Green Books", published in 1936-1966, and introduced us to the need and importance of these travel guides to African-Americans travelling during segregation. We met at the Summerour House to hear about the Green Store and the Green family, then walked the short distance to the Green Store for a tour of the building, its contents of historic items, and learn about ongoing projects. The store is a wonderful example of the small general stores that populated our area in the past and served local farm families. Jack Morton and Jim Spruell - boyhood memories living in this area when it was still a rural farming community. 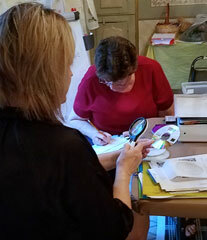 "Sorting a Collection of Newtown Records"
We had fun and learned collection management procedures while examining, identifying and recording the contents of 7 boxes of the Susan Miller collection of Newtown Park and history items. 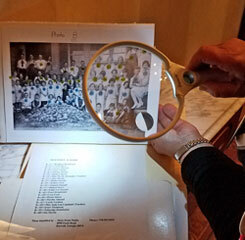 Examining a photo of Newtown school students and other items related to the creation of Newtown Park and Newtown's history. We shared some of our research and listened to Millie Medlock Moore relate stories and memories of the area in earlier times. Wednesday, April 5 - Cancelled for threatening weather. 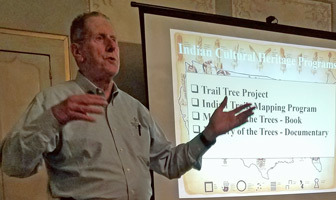 The wide variety of resources available for researching both local and family's history was presented - books, online resources, history research centers, and more. We are encouraging membership in the Johns Creek Historical Society to support startup costs, programs, activities, and projects. Info on becoming a member.